As the US healthcare debate rages on, Twitter has become an ideological battleground - with the UK's National Heath Service at the centre of it. As Democrats and Republicans alternately praise / criticise the British NHS system, people in the UK have started to respond. 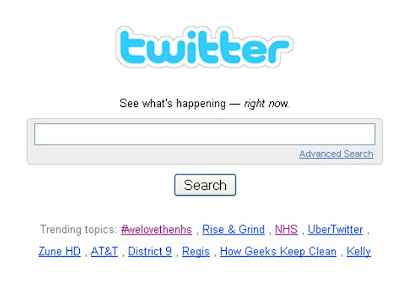 The hashtag #welovethenhs is the top trending topic on Twitter and 'NHS' is being regularly used as British Twitter users join the debate and 'defend' / highlight examples of NHS experiences. 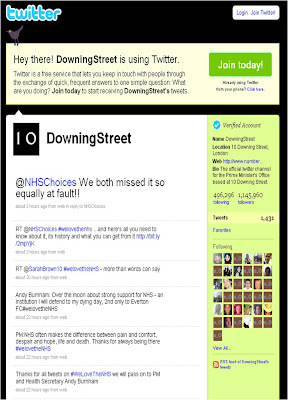 The official Downing Street Twitter account has got involved - passing on a message from Gordon Brown and retweeting (his wife) Sarah Brown's NHS message. The really interesting thing is that the US healthcare discussion, and the resulting NHS Twitter activity, may have re-ignited the UK political debate about a 'free-to-all' health service in the UK. However, Gordon Brown will probably not be able to contribute much more before it is interpreted as interfering in US affairs and the @conservatives Twitter account is strangely silent on the subject. With a UK election (at most) 9 months away it will be interesting to see how both Gordon and David Cameron respond to the #welovethenhs Twitter debate - there are votes to be won or lost here! I love the fact that the Investor's Business Daily declared that Stephen Hawking would not receive treatment under the NHS. "People such as scientist Stephen Hawking wouldn't have a chance in the UK, where the National Health Service would say the life of this brilliant man, because of his physical handicaps, is essentially worthless," it said. I'm just glad Stephen Hawking came out to correct them by pointing out he's British! "I wouldn't be here today if it were not for the NHS"
"I have received a large amount of high-quality treatment without which I would not have survived." The thing that is fascinating me is that a national debate in the US is now getting global contribution. I'm still not sure I understand the logic behind half the protests in the US and it's not really something I want to get drawn into as I don't live there. 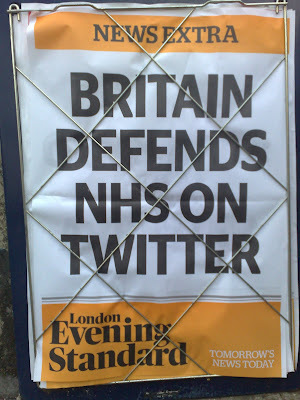 However, social platforms like Facebook / Twitter are global and it will be interesting to see where the 'no NHS' / #welovethenhs debate ends up.